Making a return to the Clyde this morning was the motor vessel BALMORAL, running mate of our own paddle steamer WAVERLEY. 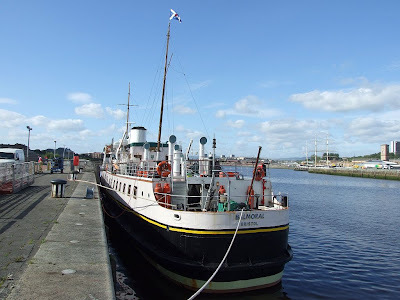 Traditionally, BALMORAL visits the Clyde each September, although 2006 was an exception, for a short programme of cruises during the Glasgow September weekend holiday. This year, she will be performing two cruises to meet up with another famous visitor, QUEEN ELIZABETH 2, which is due to berth at Greenock tomorrow morning on a Round Britain cruise celebrating the 40th anniversary of her launch.